Chez Panisse and some of the biggest names of Northern California's food scene are hosting benefits during the month of May to support the highly regarded UC Santa Cruz Apprenticeship in Ecological Horticulture, which has trained more than 1,200 organic farmers over the last four decades. In addition to Chez Panisse, Jardiniere, Flea Street Café, Gabriella Café, and Ristorante Avanti are among the restaurants that will donate a portion of sales to the Grow a Farmer fundraising campaign to help raise money for apprenticeship housing at UCSC. The residential aspect of the program immerses apprentices in the cycles of farming and has helped keep the apprenticeship affordable to participants from across the U.S and around the world. 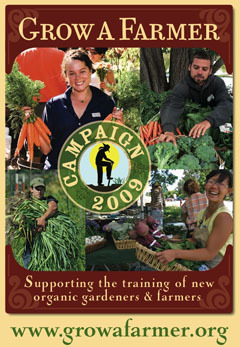 Supporters from the San Francisco Bay Area to the Monterey Bay region have jumped on board the Grow a Farmer Campaign, which has a goal of raising $250,000 by June 30, 2009. "Restaurateurs like Alice Waters were among the first to embrace organic farming, and they are rallying to help us meet this unprecedented challenge," said apprenticeship instructor Orin Martin, manager of the Alan Chadwick Garden at UCSC. The university has approved plans for eight four-room tent cabins that would accommodate 32 apprentices. The Grow a Farmer Campaign is enlisting the help of farm-loving restaurants, businesses, organizations, and individuals, with a focus on May as Grow a Farmer Month. Chez Panisse will donate a portion of proceeds raised Wednesday, May 6, to the Grow a Farmer Campaign. Other supporters include Flea Street Café in Menlo Park and David Kinch of Manresa in Los Gatos, who has pledged chef's tasting dinners for four to the campaign's two highest individual donors. In the Santa Cruz area, Ristorante Avanti will donate a portion of proceeds raised Monday, May 4, and Gabriella Cafe will do the same on Wednesday, May 13. New Leaf Community Markets will hold a Community Day for the Grow a Farmer Campaign on Thursday, May 28, donating 5 percent of profits from all five of its Santa Cruz-area stores. Other local businesses donating in May include River Café and Cheese Shop, Companion Bakers, Engfer's Pizza Works, Redwood Pizzeria, TLC Ranch, The Buttery, Soif, Love Apple Farm, Chocolate, La Posta, Roots of Wellness, Matthew Sutton Yoga, and Verve Coffee Roasters. In addition, on Wednesday, May 6, Capitola Book Café will host a fundraiser reading with esteemed Santa Cruz poets Gary Young, Amber Sumrall, Barbara Bloom, Rosie King, and Joe Stroud; live music begins at 7 p.m.
Other business support comes from Earthbound Farm, Driscoll's, Veritable Vegetable, McEvoy Ranch, Renee's Garden Seeds, Swanton Berry Farm, Johnny's Select Seeds, Seeds of Change, Stonyfield Farm, Gayle's Bakery, and Earl Organics. Please see the Grow a Farmer Campaign web site for a full list of participating businesses and events. The final fundraising push for the new permanent housing began in December. Signature gifts so far include $50,000 from Newman's Own Foundation, $20,000 from obaboa Foundation as a challenge grant from Olivia Boyce-Abel, and two $10,000 gifts from anonymous donors. In addition, individual supporters have contributed more than $33,000 in amounts ranging from $25 to $2,500. Graduates of the apprenticeship include Claire Strader, top vote getter in the recent grassroots campaign to elect a "White House Farmer"; Cathrine Sneed, founder and director of the San Francisco County Jail's Garden Project; Blair Randall, who coordinates San Francisco's Garden for the Environment and was responsible for the Victory Garden in front of San Francisco City Hall last summer; and many small-scale organic growers around the country and abroad who form the backbone of the organic farming movement. Interest in the training program is at an all-time high, with a record 152 applicants vying for the 38 positions in the 2009 Apprenticeship.